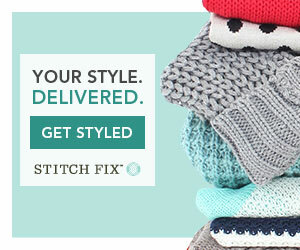 Shipping - I live about 30 minutes from Linda, so I always receive this subscription really quickly. This was sent on the 10th, and arrived on the 12th, just 2 days later via USPS. Product Size - There are two variations of this subscription, a sample size and a full size. The sample size used to come in clamshells, but Linda is making a move to 3g jars instead going forward, as are the products on her website. And the full size jars used to be square jars, but will be round jars from now on. Some bonus items in this subscription still came in clamshells, as I imagine Linda is trying to use up what she has left of these. 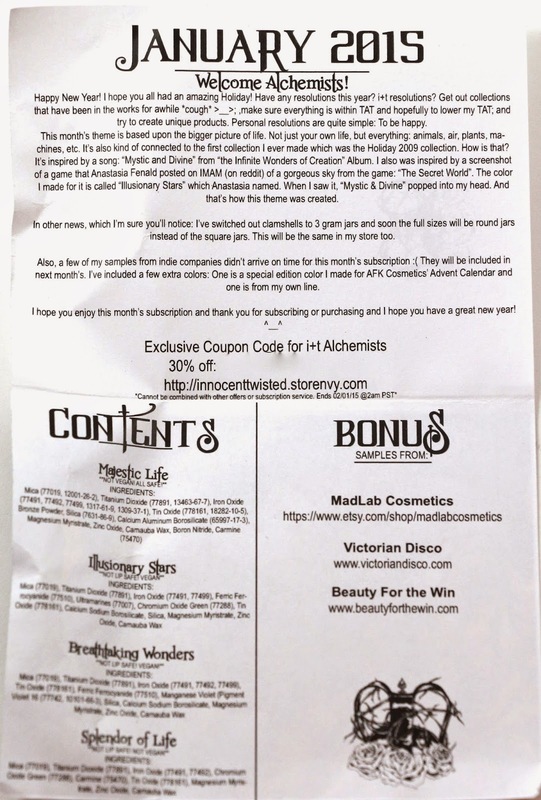 Free Samples - This subscription always comes with bonus items, this month the regular items didn't arrive in time. So we received two bonus samples from Innocent+Twisted Alchemy, and also 3 bonus sample bags from three different indie companies. Here is the info card for this month. There are a few unique qualities to this subscription that other indies don't do for theirs. The sample size version always comes with a 30% discount code for the shop, and the full size version comes with a 35% off discount. Another difference is that we always get bonus samples from other indie companies. Usually random samples, but they are one of my favorite things about this subscription. The bonus samples are almost always something I don't already have, and frequently they are from companies I haven't tried yet. I love getting a chance to try new companies, and even better when it comes in the form of an extra sample from this sub, that I can try and decide if I want to buy from in the future. This shade is kind of a taupe-y pinkish shade with a slight sheen and some silver sparkles. A little hard to describe, but it looks like a nice neutral shadow, which is something that I have been getting back into lately. I bet it would make a nice all over shade, which is another thing I love recently, easy and quick all over shadows are my jam. This shadow is really beautiful, it really reminds me of the night sky. It's a dark blue black base, with tons of green, blue, and silver sparkles, and a blueish sheen. The camera couldn't really capture it all, it's a shade you have to see in person. Just beautiful though, and would look great in the crease paired with any of the other shades this month, but I would say especially Splendor of Life. This shade is a muted gold, with a golden sheen and gold sparkles. 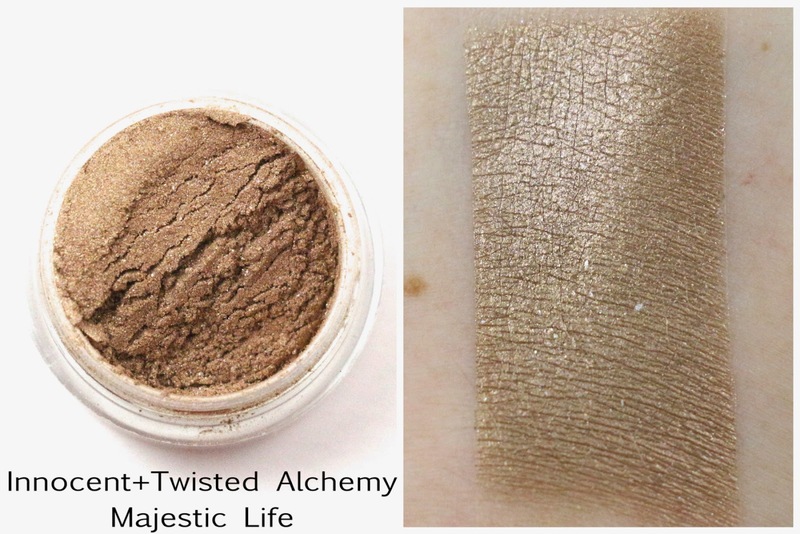 Very creamy feeling as well, and I think this would also make a great all over shade, or paired with Illusionary Stars used as maybe an eyeliner. This shade is a blueish gunmetal gray shade, with a slight blue sheen and gold sparkles. 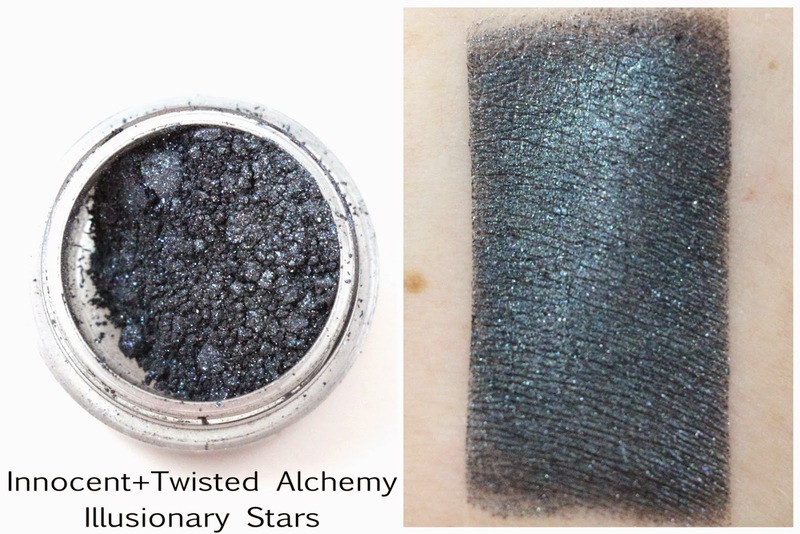 Again, another great all over shadow, or would pair beautifully with Illusionary Stars in the crease. 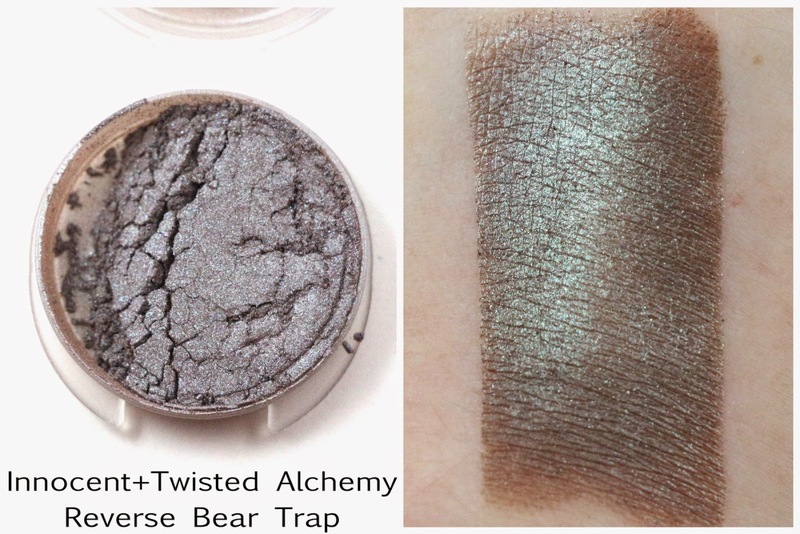 Reverse Bear Trap - "Taupe with aqua shimmers and has a green and slight purple sheen." 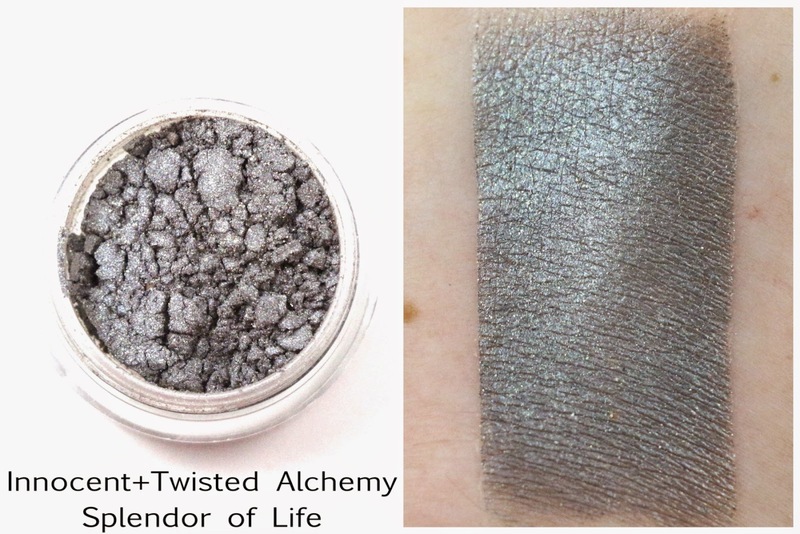 This was one of the bonus samples from Innocent+Twisted Alchemy because the others didn't make it in time. It's a shadow from the Live or Die collection, which I have been meaning to try. 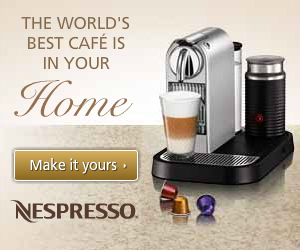 I don't agree with the description of this though, I saw it as more of a warm medium brown with a strong green shift. It's a very interesting color though, I'll have to use this as an excuse to try some other products from I+TA. 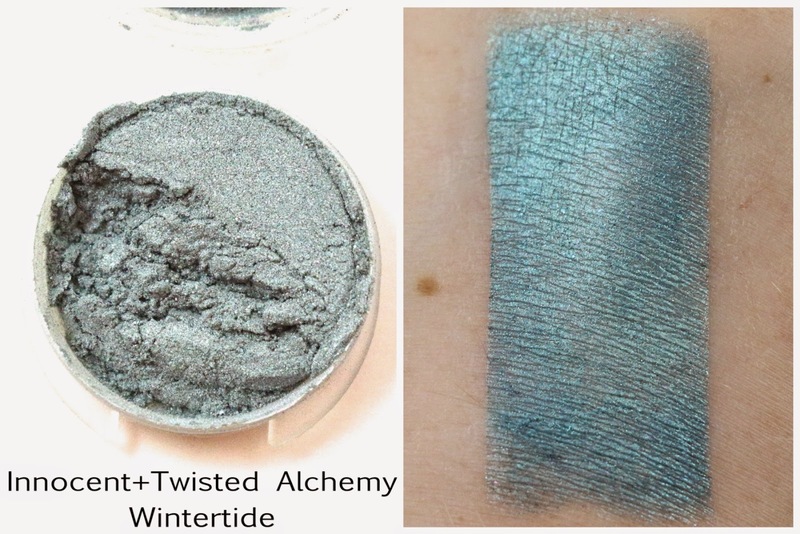 This was another bonus sample, but this shadow made an appearance in the AFK Cosmetics Advent Calendar that I reviewed here, and I just love this shade. It's just a beautiful icy blue shade, and it was so limited, that it's great that more people get a chance to experience it. 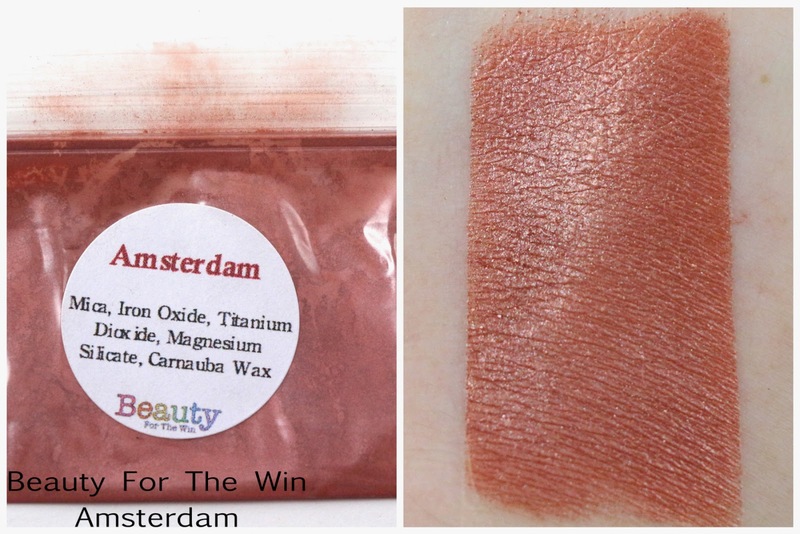 Beauty For The Win Amsterdam - "Red-brick like the houses lining the canals of Amsterdam. Turquoise and blue sparkles subtly add a glimpse of the water." I have heard a lot about Beauty For The Win, but haven't had a chance to try any of their stuff before now. This shade is from their collection inspired by The Fault in Our Stars. The shadow itself was very nice, but I found the color kind of lacking compared to their website swatches. I was expecting a bit more red, but instead I got mostly orange. And I didn't really see the blue sparkles at all. 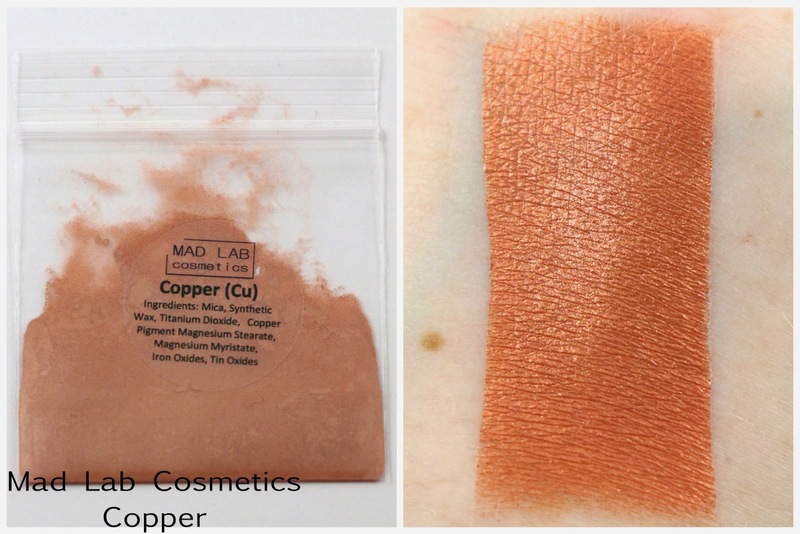 Mad Lab Cosmetics Copper - "This is untarnished copper; an lovely red-orange with a stunning shimmering finish that almost seems to burn." I've actually reviewed this shadow and company before here, and I think by now you all know how I feel about orange shadows. It's not that I don't like orange, or like it as an eyeshadow color, it's just that I get one in just about every collection, and I just don't wear orange enough to need that many variations on it. 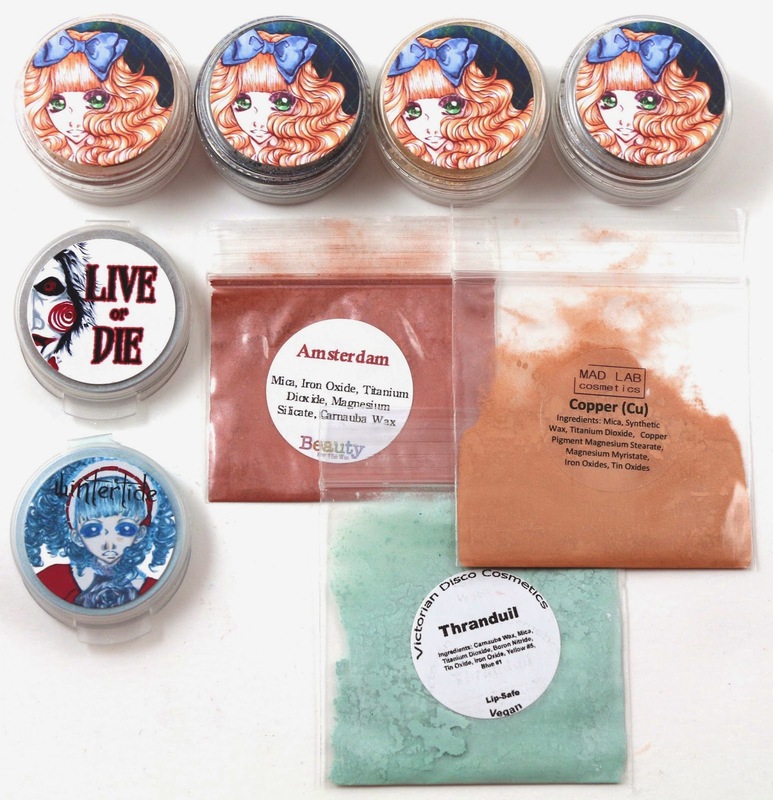 However, I will say that I've really liked most of what I've tried from Mad Lab Cosmetics, so if you haven't checked them out yet, I suggest you do! 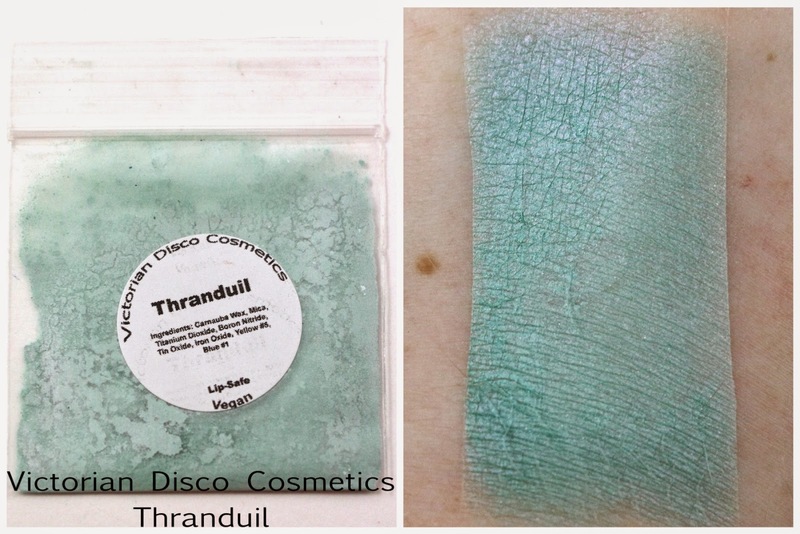 Victorian Disco Cosmetics Thranduil - "Light green with a red and purple shift." I am surprised to see Victorian Disco in two indie subs this month considering she has closed up shop for the time being, and will only be selling her products through third parties. This shade I received is more of a light blue green with a slight red shift, and an almost matte base. I've got some other Victorian Disco Cosmetics reviews coming soon, so stay tuned for those. 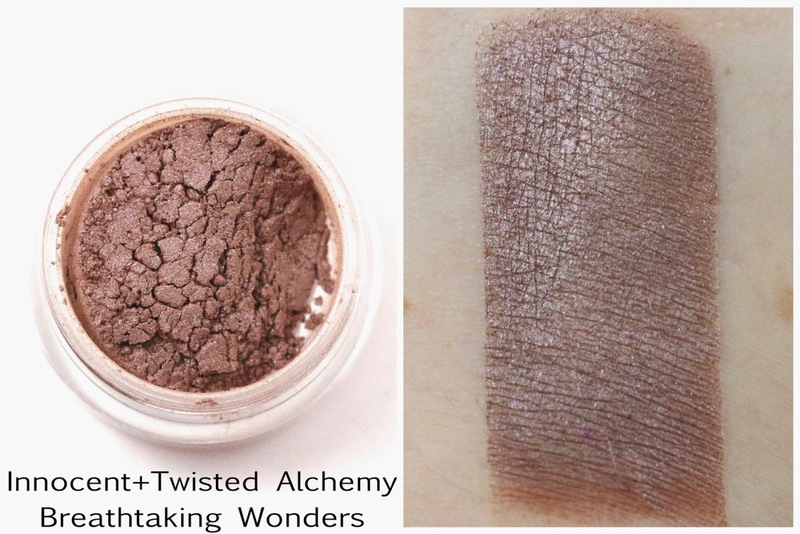 Overall, I think this month's Innocent+Twisted Alchemy subscription had a really high value, and the main shadows this month were really versatile. 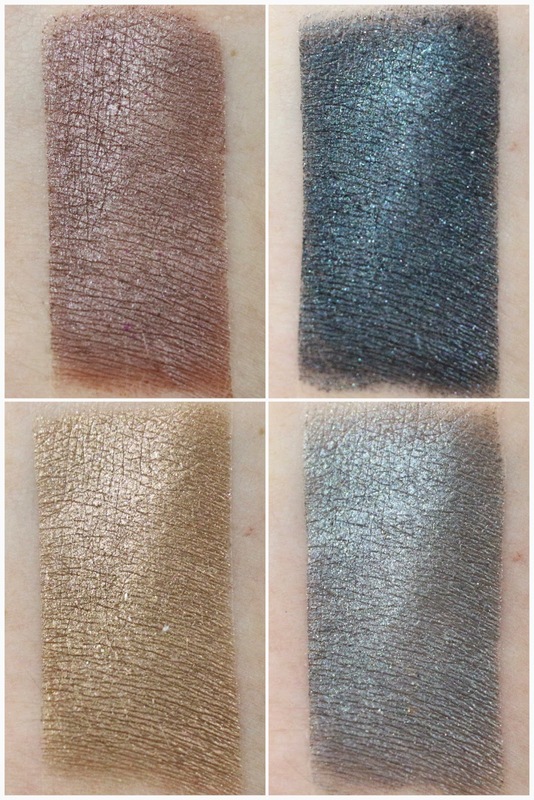 However, a few of the shades reminded me of October's shadows, or just of shadows I've swatched recently in my own collection. They were not particularly unique looking to me. But I will say that out of all of the kinds of shades I could be receiving dupes of, these kinds of neutral shades would be my pick. I think my favorite was definitely Illusionary Stars since it is the most unique of the bunch I think. And I loved how many extras we got this month. If there was no note about the missing extras from other companies, and we only received three sample bags from the other shops, I would have been satisfied with that. Receiving the two extra clamshells of I+TA shadows, was a really nice surprise. And really showed me that I need to break out my discount code I received this month and order some things for review! Availability - This month's subscription is no longer available, but you can purchase some of the bonus extras from their respective websites which I've linked above. To try and subscribe to this subscription, check the Facebook page for updates. Subscriptions usually go live on or near the 1st of the month. Overall Satisfaction - My favorite shade was Illusionary Stars, and I liked the general neutral shadow theme this month. 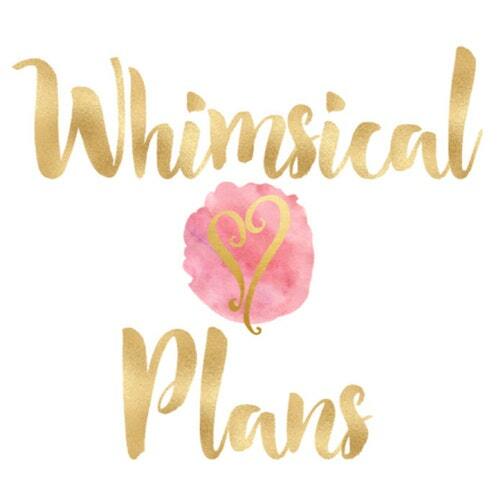 I love that this subscription always introduces me to a new indie company, so I will definitely be continuing my subscription. When you sign up for this Subscription are you able to keep getting them or do you need to keep signing up every month? It's recurring! Once you're in, you are in. No need to resign up. Thanks! I think Illusionary Stars is my favorite too!! But There all so Pretty!